The dollar's status as a "safe haven" currency (see this post for some background) came into question yesterday. Typically in a "risk on" equity rally, we've seen the dollar sell off. The reverse was also true as the dollar tended to rally in a "risk off" scenario (particularly when the world looked scary). "Safe haven" currencies tend to be negatively correlated with risk assets such as equities. But yesterday we saw both the equity markets and the dollar rally. This change in correlation from negative to positive may indicate the market's perception of US rates moving higher sooner than expected (which would make the dollar more attractive on a relative basis.) 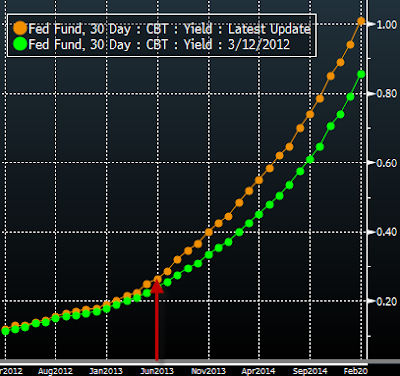 The Fed Funds Futures curve has shifted the expectations of the first Fed rate hike to June of next year (from August). 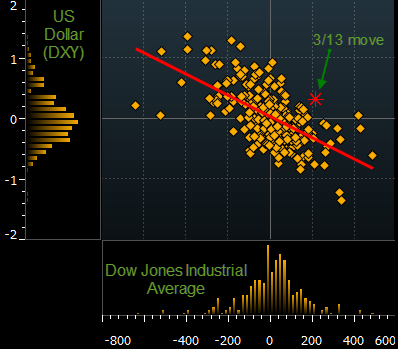 These changed expectations should bode well for the dollar going forward, and days of the correlation reversal may become a more common occurrence.